So, pre-competition disorganization aside, I was still stuck being the only competitor in my division. Was it worth the over-priced $40.00 fee to get a measley gold-colored medal? Naw … I didn’t think so either. So I decided to help out my teacher, Hao Zhi Hua, with judging. I was the “So and So Competing … so and so on deck … ” person, keeping scores and timing competitors. It was my first time doing that so I guess the whole experience wasn’t for naught. There were four judges in my division (wushu), Tony Chen, David Chang and Laura Woodward (?? … don’t ask). David was having reservations to start with because he didn’t feel qualified to judge, and, needless to say, having started wushu after him, neither did I. But he had more seniority than I so he got the duty. Anyway, the first competition was Wushu Chang Quan. There were lots of Sifu Meng students competing, a couple Tony Chen students and a variety of other miscellaneous competitors. One young student whose name escapes me at the moment was pretty impressive doing butterfly twists, jumping inside splits and the like. He was a student of Tony Chen’s. Quite impressive, although his basics could have used a little more work. Next up was Nan Quan and the singular Sifu Meng student who competed in this division “swept” the event. I was still a little sore that I didn’t get to compete against any Sifu Meng students. As I recalled from the year before there were quite a few of them competing in Nan Quan and I wondered why there weren’t any this year. But wait .. as I sat there at the judging table I looked over at the Traditional Southern Fist ring and what did my wandering eyes perceive but a myriad of yellow and orange neon outfits going “kiya!”, “hai!” and “wo!” while performing the Compulsory Southern Fist routine. Umm .. EXCUSE ME? What’s going on here? A few thoughts popped in my mind: (1) What are they doing performing a modern wushu routine, most likely created in the last 10 years, in the TRADITIONAL southern hand forms division? (2) Why are all the judges their own teachers? and (3) Why aren’t they wearing any shoes? I think the answer to question one was also the answer to question two. As for question three I can only hazzard a guess … Umm .. they can’t afford shoes? They haven’t learned to tie laces yet? I don’t know .. I don’t care. It was all pretty annoying. I suppose they were all told that they should compete with that form in that division so it’s nothing on the students themselves. I just question their instructor’s judgment. I’m still kind of miffed that I didn’t get to compete against them…. Anyway, I was busy in Ring 3 helping with the judging so I didn’t have time for much introspection just then. Next up was Long Weapons which went along pretty much like the other divisions. There were three competitors in the Intermediate division and a frustrating thing, at least for the third competitor, was that, after the first two had already competed, one of the tournament organizers came and made us have the last guy do his form on this really sucky mat from ring 2. I felt really bad for the guy. He was at a total disadvantage. The other two guys didn’t have to compete on this mat but he did. I could tell he was having a hard time of it to because his staff kept bouncing all over the place when he’d slap it down. I guess the only consolation was that he won the division. Next up was short weapons. This one was interesting. It was a face-off between Ishmael Abdul and Billy Shih. I have to admit, it looks like Ishmael’s been practicing … or something to that effect because he wasn’t nearly as out-of-wind as he was at the Regionals. He also changed his form around a bit which was interesting. Billy Shih looked really good, but then, I’m kind of biased since he’s both my class-mate and my co-worker. Anyway, Billy won the event and Ishmael tied for second with another guy. Another thing I noticed was that some of the judges were having a hard time not laughing at some of the competitors’ wushu. 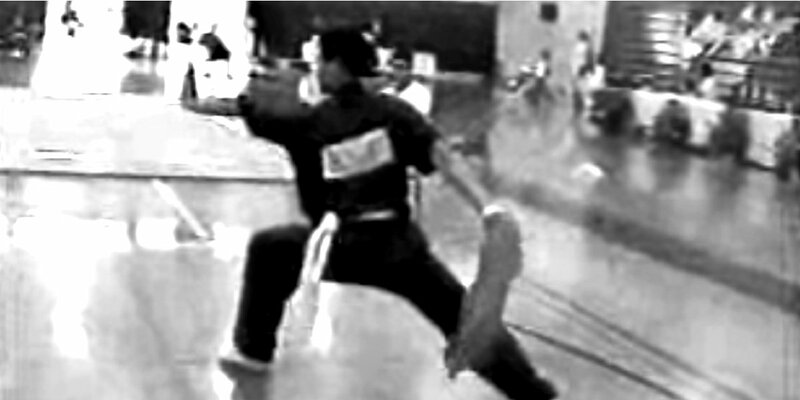 Especially some of Sifu Meng’s straightsword competitors. What’s up with holding the blade with your other hand? Umm .. Did you not want to use those fingers any more? And putting the blade under your arm pit? That’s not only silly looking but down-right dangerous. What’s the application for this one? Cut off your own arm before the other guy can get to it first? Scare your opponent by making him think you’re crazier than he is? Well … it was all pretty humorous to at least a fair amount of people. I could tell that many of Sifu Meng’s students were used to competing at Karate Tournaments because they all were rehearsing their “judges introductions” before going up. I told them they didn’t need to do that. As per wushu competition rules they’re supposed to salute in to the ring and start their set. I figured I’d spare the head judge from listening to every competitor’s autobiography. It probably seems like I’m bagging on the Sifu Meng students, and maybe I am a little bit, but it’s not really the students that bug me. it’s the fact that they are led to believe that what they are doing is authentic Chinese Martial Arts. I’m not saying I’m the end-all, be-all of Wushu, but I think it’s really detrimental for them to be told what it appears they are told. There are, I will happily admit, some students at that school with some excellent potential and good skill. Unfortunately, I think they’re going to have that potential and skill underminded by incorrect teaching and shoddy basics. This is just my opinion and I am presenting it as such. If anyone out there really disagrees with me then they’re welcome to put up a web page and report on their own feelings as well. I, for one, was rather disappointed by the whole affair. At least this year’s wushu judging was fair. Thanks for the memories, I dumbed down my form as it was in intermediate competition. Considering Billy is a student of mine it wasn’t really a fair competition. Had fun.